The drawings show typical dimensions. Instructions are given below to adjust the size of the bench to your body, available wall space, and your vice. Doris Aller, Sunset, Wood Carving Book, (Lane Books, Menlo Park, California, 1951). Unfortunately this book is years out of print and its replacement in the series is not nearly as good. The bench is built around a woodworker's vise and this vise is a major purchase ($100 to $140) for a person starting in woodworking. The vise must be rapid-acting so that you can pull it straight open. It must have steel jaws (you will face them with hardwood). A wooden handle is best. It must have a vise dog (a metal tab that can be pulled up) to allow planks to be clamped flat on the bench. It should have a jaw width of 8 or 9 inches. This vise must bolt up under the bench, not clamp on top it. The top to this bench requires six construction grade 2x4's eight feet long in pine or fir. They should be straight and have only a few knots. Large knots will make the top surface hard to plane. Avoid very soft pines. Utility grade lumber is not _ satisfactory and pallet material is poor. Spend a little money here. The legs and braces are made from three similar 2x3's or 3x4's and can be salvaged or pallet material. The back tray and bottom shelf are four one-by planks or pieces of plywood. This is a good use for recycled materials. Scavenged 3/4 inch plywood works particularly well. I have made a half dozen of these benches and never bought new wood for anything except the top. The drawer is build from one-by material with a 1/4 inch plywood bottom. Again scavenged material works well. Much of this hardware can come straight from the junk box. Do not be afraid to substitute what you have of anything except the rods. Half inch rods do work but are no better than 3/8. A medium squeeze bottle of wood glue is needed and a few drops of Lock-Tite tread locking compound are a big help. Solid paraffin, an old candle stub, is the best lubricant for the wooden drawer slides. Saw - Hand saw, table saw, radial arm saw, skill saw, power miter box, or jig saw. Drill - Brace and bit, or power drill. For more detailed drawings, use with this little freebie form. Have fun building this bench. Consider the following suggestions rather than commands. Cut six of the 2x4's in half. Square off both ends and match the lengths at about 47.5 inches. Lay them out on edge face-to-face with their best edge up. Put all large knots down but if you have two good edges, put the crown up (high point in the center). Choose the best piece for the front and a good piece for the back. Number the pieces and mark the top. On the fount piece, drill out the counter sink holds for the nuts and washer stacks. Place hole outside the vise close to the end of the piece but leave at least 3/4 inch of solid wood. The counter sinks should be about 7/8 inches deep and may be drilled with a brace and adjustable bit or with a hole saw. It is important the rod ends be completely out of the way. Drill the rest of the way through the wood with a 3/8 bit. Mark and drill all the remaining top pieces with three 1/2 inch holes. A marking jig made from a scrap of wood the same size as the 2-by with three small holes drilled into it for an awl is a big help. Remove all brake-out splinters. Cut the threaded rods to length (usually in half) and file off all burrs and saw marks. Place a bolt on the good end of each rod and fix it with either Lock-Tite or by peaning the last tread down. Place a 3/8 flat washers and a large heavy flat washer on each rod. Tread the rods through the first wood piece so that the nuts and washers are within the countersinks and the rods point straight up. Spread glue evenly on each wood face and stack the pieces on the threaded rods. Watch the numbers and the top sides. Put two washers and a nut on each rod and finger tighten the nuts. Lay the top on a flat concrete surface, top up. Tap the wood pieces down with a scrap of wood and a hammer. Do not strike directly on the top but hit the wood scrap has hard as you like. Tap the ends in line and check the square. Hold the front nuts with wrench and tighten the back nuts only. Do not tighten the front nuts. Tighten the back nuts evenly, 1/2 turn here, 1/2 turn there. Scrap off the excess glue of the top with a putty knife and a wet sponge. Pull the bolts down until all gaps are closed and glue runs from the joints. Pull the back large washers about half way into the wood. Check that the top is the same width at each rod. Let the top sit over night. Build up the legs and cross braces. Measure the distance from the floor to the height of the point of your pelvis bone (a little below the navel). This is the best height for the work to reduce back strain. Subtract off the thickness of the top and an average thickness for the work (about 5 inches). Cut the legs to this height and bevel the bottoms of each. Note how the top braces are notched and drilled to accept the lag bolts. The braces are also notched on the side to accept the legs. Bolt and glue the legs and braces together. The bottom shelf and back are cut to about 44 inches. The self would be 9.5 to 14 inches wide and the back 9.5 to 16 inches depending on available scrape lumber. Notch the bottom shelf for the back legs and screw and glue the bottom shelf and back in place while checking the square. Cut the top back piece to the same length as the bench top. Temporally tack it on with four nails. Place it low so that it does not extend much past the top of the legs. Turn the top over so that the top surface is top down. Place the leg assembly upside down upon it. Move leg assembly so that at the outside edge of the vice end leg is one inch from the front and from the end. Sit the vice in place and make sure it is unobstructed and clear of the rod nut and washers. You want the vice as close as possible to the top side edge without getting into trouble. Set the vice aside and drill and lag the leg assembly in place with the braces perpendicular to the top front. Put the vice back in place and mark around its mounting area. Take the vice apart into two pieces if this is easy. Check to see how far up the face of the top the fixed vice jaw comes. Vices are not usually designed for 3.5 inch thick benches, so some material will have to be chiseled away from the bench bottom. You want the fixed vise jaw to stop 3/8 inch from the bench top surface. This will allow plenty of room for surface planing now and in the future. Remove the leg assembly and fit the vice to the bench top. You also may wish to let the vise into the face of the bench about 1/4 inch but not to deeply. Chisel way material from the bottom until the vise fits to the correct heights. Make sure the chiseled surface is flat. Plane the face of the bench top. File flats on two washers to make them 'D' shaped. Drill the bench top and attach the vice fixed jaw with two lag bolts (with the D washers) and two large screws in the face. The D washers must rest flat against the cast steel vice jaw. Install the complete vice and replace the leg assembly. Turn the bench right side up and place some weight on the bottom shelf; a tool box will do. Cut two pieces of scrap 1-by hardwood, oak or maple, a little larger than the vice jaws. Hardwood flooring scrap works well. These faces should stick up high enough to be planed with the top. The fixed jaw usually has threaded holes for bolts to attach its jaw face, and the moveable jaw has screw holes from the outside. Fit the top self to fill the room from the bench top to the back legs and screw it to the cross braces. Remove the back piece, round its corners, and screw and glue it in place. Drill a series of 1 inch holes straight back from the vice dog for a bench dog. The bench dog is a piece of very tough wood like hickory about 6 inches long. It must be 1 inch round for the bottom half and larger for the top half. My best was made from a sledge hammer handle. Plane the bench top and the top of the jaw faces. Put some time on it. Put some energy into it. Try to take the top down below the rounded edges of the original 2x4's. Stop 1/4 inch from the vice steel. You can now use your new bench to build the drawer. The drawer should be wide and shallow. The face should be low enough so that you can still pull it open with a plank clamped horizontally in the vise. This will leave about a 2 inch gap between the drawer face and the bottom of the bench top. Wooden runners work fine for the drawer but make the sides very long. Closed the drawer face should be 3/4 inch back from the top front and any hardware should be recessed. The top is unfinished so that it can be replaned yearly. The legs and drawer may be painted with based enamel. 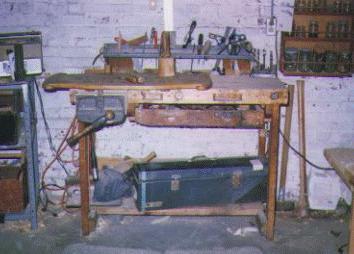 This bench is a little front and top heavy, particularly with the vice extended and holding work. Storing heavy tools on the lower shelf helps but securing the bench to the wall greatly increases safety. Use two lag bolts with washers passing through the top back piece and screwed either into studs or into masonry anchors. You can then bang away on your project to your hearts content. I hope you have fun with your bench. One has been my true friend for many years. This design package is similar to the ones for the simplest computer desks. The major desks have many more drawings and more detailed instructions. Woodware would like feed-back on how you get along with these instructions and drawings. We would also like some help from someone in a metric country so we can adjust this design for you.